Alan, the beadle of the manor of Bampton, had gone out at dusk to seek those who might violate curfew. When, the following morning, he had not returned home, his young wife Matilda had sought out Master Hugh de Singleton, surgeon and bailiff of the manor. 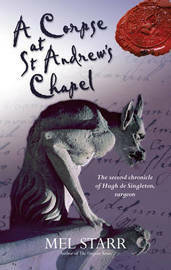 Two days later his corpse was discovered in the hedge, at the side of the track to St Andrew's Chapel. Mel Starr was born and grew up in Kalamazoo, Michigan. After graduating with a MA in history from Western Michigan University in 1970, he taught history in Michigan public schools for thirty-nine years, Since retiring he has focused on his highly successful novels. Mel and his wife, Susan, have two daughters and seven grandchildren.